Where else in the world can you ski in a t-shirt one day, and puffy jacket the next? We’ve enjoyed classic California spring conditions, but welcome back winter with more snow this week. Make time to attend The Greatest Ski Competitions Known to Man and Woman: the Pain McShlonkey Classic at Squaw Valley! This action packed on and off-mountain event serves as a hilarious tribute to legendary skier Shane McConkey. 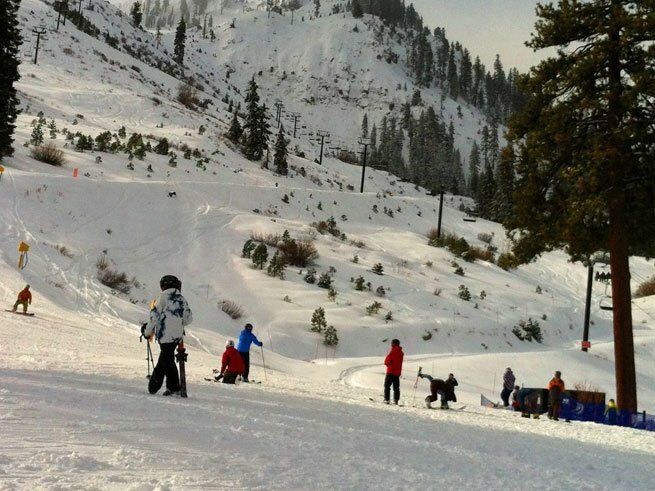 Guests of Squaw Valley Lodge can join the Granite Chief Ski and Snowboard Shop’s private Demo Day. Sign up starts at 9am in the Squaw Valley Lodge Ponderosa Room. Purchase your skis for next year and receive a preseason discount. Your new skis will be ready for pickup next fall! *$126 per night rate represents 3 nights in a Standard Room with the “3rd Night Free” promotion, valid through April 4, 2013. Rates are lower beginning April 7. Promotions are subject to availability, change, blackout dates, and nightly minimums. Colleen Conners-Pace is back with continued tips for Ironman Lake Tahoe! In this post, she breaks down the second step of Ironman training: moving from the Prep Time to Base Training Period. As you move into the Base Training Period, you will begin to focus more on aerobic endurance. 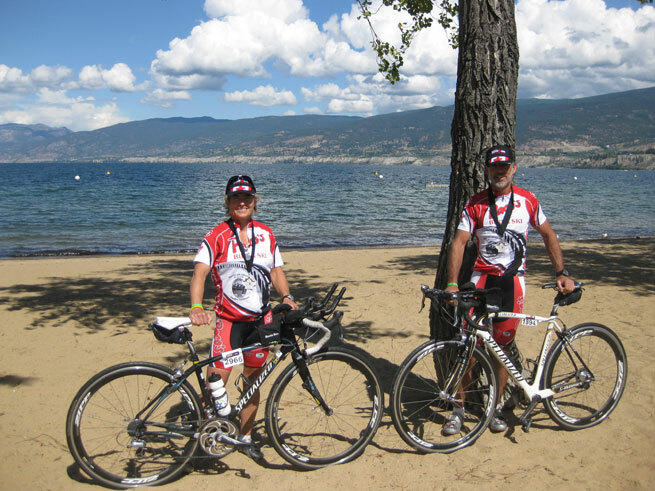 Without endurance you will never finish the Ironman Lake Tahoe. To train for aerobic endurance you need to keep the intensity low so the body can make physiological adaptations required to be more efficient at delivering oxygen to the working muscles. Thus, the muscles become more efficient at using the oxygen to break down fuels, primarily fat for energy. Work too hard and you train more of your anaerobic energy system, hence, you will not create the desired adaptations of increased aerobic fitness. So how hard or easy should one go to achieve the benefits of these physiological adaptations? The best way to know is to do a Lactate Threshold Test. This will help identify your aerobic zones so you train at the right intensity and get the biggest bang for your training time. This test can be done on a treadmill or bicycle, or both, as heart rate training zones are different for each sport. Zones from one sport can be estimated from the other, but it is simply an estimate. If you have a power meter, power zones can be calculated from the Lactate Test along with the heart rate zones. For more information on Lactate Threshold testing go to Tahoe Peak Endurance, LLC. Stay tuned for a minimalist approach on Ironman training: a much healthier, saner training plan than most out there! While skiing and snowboarding is a ton of fun, dangers lurk all around you. Learn what to look for in deep snow, conditions that cause avalanches and brush up on your companion rescue skills at the free workshops offered twice a month by the Squaw Valley Ski Patrol. Whether you’re an experienced skier polishing up or a beginner learning for the first time, this free workshop is open and beneficial to all levels. Just dress warm and bring a beacon to participate. Host of the 1960 Winter Olympics and 1969 World Cup tour, Squaw Valley one of the largest and most popular ski destinations in the US. Located in the Sierra Nevada, the valley has recently teamed up with neighboring Alpine Meadows and now offers visitors access to 6,000 skiable acres, 43 lifts, over 270 trails, beginner areas and unequalled expert slopes, chutes and bowls. 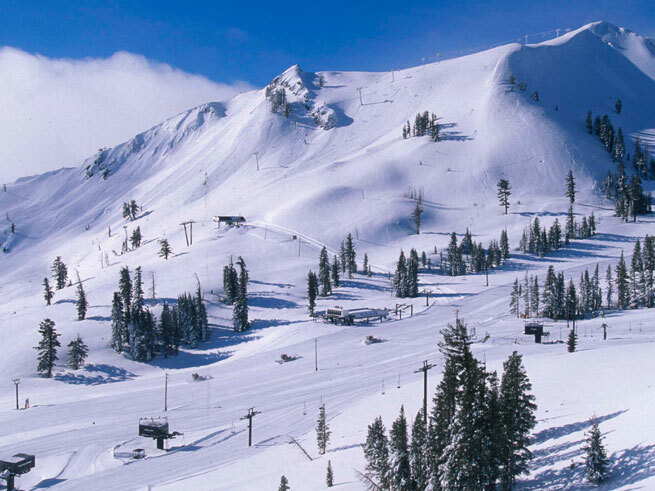 Squaw Valley is a beautiful mountain getaway with wonderful dining, shopping and outdoor adventures for every season. In the summer, the Village at Squaw Valley heats up with fun music festivals, art shows and wine walks. Welcome athletes, coaches and spectators from across the country for this action packed weekend that includes an opening ceremony, athlete galas, spectator parties and world-class racing! Held at Squaw Valley, The 2013 Nature Valley U.S. Alpine Championships is the finale to a year filled with ski racing and snowboarding competitions among the top athletes in the US. Consisting of a record setting US Ski Team alumni and coupled with top-rated slope and pipes, Squaw Valley has become one of the greatest winter sports destinations in the world. See some of the most popular local boarders Julia Mancuso, Travis Ganong and Marco Sullivan rock the pipe. Host of the 1960 Winter Olympics and 1969 World Cup tour, Squaw Valley is one of the largest and most popular ski destinations in the US. Located in the Sierra Nevada, the valley has recently teamed up with neighboring Alpine Meadows and now offers access to 6,000 skiable acres, 43 lifts, over 270 trails, beginner areas and unequalled expert slopes, chutes and bowls. In the summer, the Village at Squaw Valley really livens up with outdoor music festivals, wine walks and art shows. 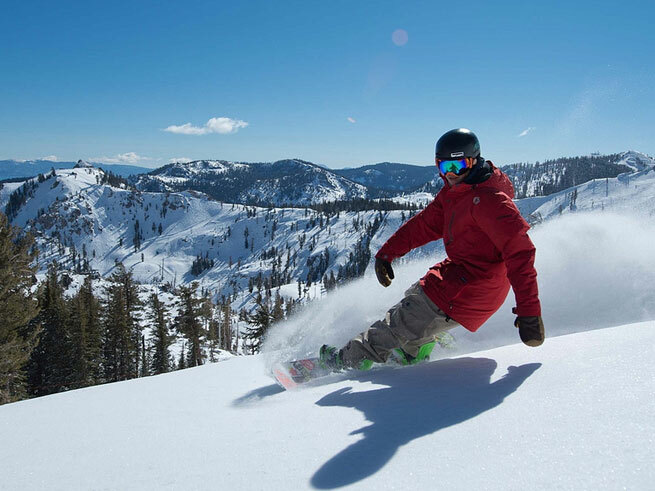 Squaw Valley is a year-round recreation hot spot featuring world class dining, shopping and adventures for every season. Photo Credit Tahoe Youth Ballet. If you’re looking for a refined evening of culture, then clear your calendar for March 15th and 16th to support Tahoe’s local ballet company at the Tahoe Youth Ballet 5th Anniversary Gala, at The Frank Sinatra Ballroom in the Cal Neva Resort. For an advance ticket to the performance, film premiere and party you’re looking at $35, or $40 at the door. Purchase your tickets HERE. Works by Constantine Baecher, Shannon Barter, Christin Hanna, Risa Larsen, Deborah Lohse, Marius Petipa & Stephen Straub. Music by Adolph Adam, Arvo Part, Marc Mellits, Mogwai and Alexander Scriabin. No plans for St. Patrick’s Day? Celebrate at Auld Dubliner in Squaw Valley! If you’re looking for the luck of the Irish, we can’t guarantee you’ll find it around Lake Tahoe on St. Patrick’s Day, but we’re sure you’ll find delicious Irish fare and traditional drinks to whet your whistle after a day of spring skiing! St. Patrick’s Day Corned Beef & Irish Special at River Ranch: Head on down to the River Ranch from 12PM-8PM, and take a seat on the deck under such sunny skies, with traditional Irish cuisine and drink specials. St. Patrick’s Day Celebration at Homewood & West Shore Inn: This is a great combo to quench your hunger for skiing and St. Patty’s Day food and drink! Start your day at Homewood at 9AM, where they offer their signature “I Shamrock Homewood” t-shirts. Once you’re off the slopes, cross the street for live music, as well as a classic corned beef and cabbage feast (until 11PM). 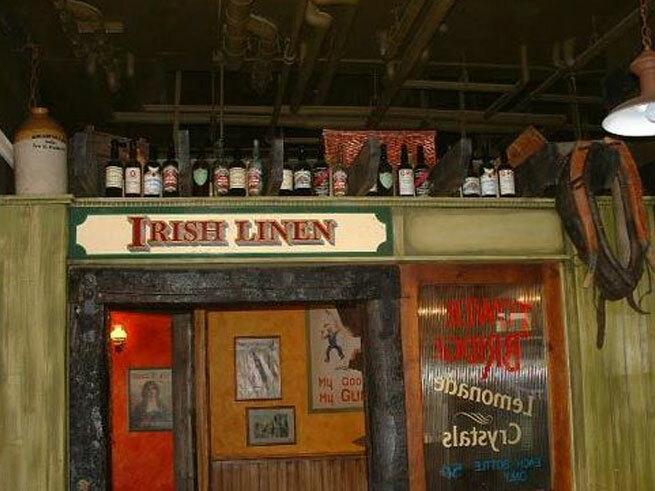 St. Patrick’s Day Celebration at Auld Dubliner: Squaw Valley’s authentic Irish pub (literally imported from Dublin, Ireland) is definitely the place to be and be seen on St. Patty’s Day! If you’re looking for the best Shephard’s Pie or Traditional Beef Stew and a Guiness on the side, then make your way here. We suggest a Black and Tan. St. Patrick’s Day Celebration at Squaw Valley: Ski or snowboard with Squaw’s lucky leprechaun! Afterwards hit up the KT sundeck for an Irish pint while listening to the tunes of Leche De Tigre, live! How do you like to celebrate St. Patrick’s Day?